These will all be a little backwards when you look at all this. There is nothing like going to the doctor for your 37 week appt. and when she checks you she says "Oh yeah, we need to induce" not that I didn't see it coming, but it is still sinking in. So Hayden will be coming a week from today! We will be inducing on Monday, January 12th. Nothing like that information to put a fire under the whole getting ready thing. 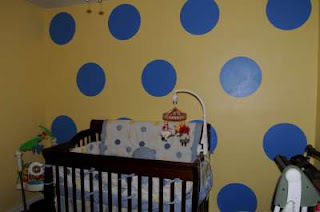 So tonight we worked on Hayden's room. 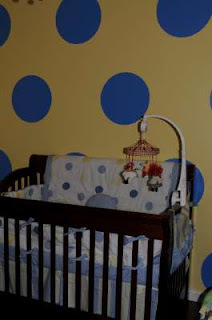 You will notice the changed theme, after months of arguing over Raggedy ann and andy for a boy, it is now been changed to just dots in blue and yellow. 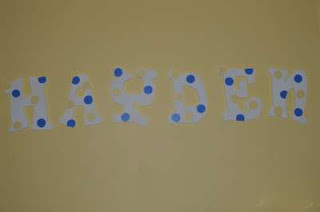 These are his letters I painted dots on. His toy and book chest. 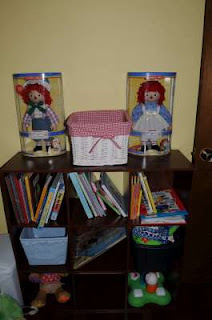 We did have some compromise and the dolls are staying, the mobile is staying too, and I still have some Raggedy ann and andy pictures to hang here above the toy chest. 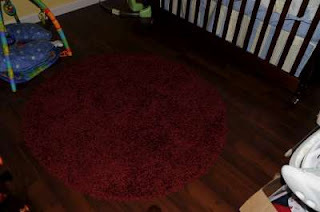 His adorable red dot rug that matches the former theme a lot better, but it still works, it is a lot more red than burgandy like it looks in this picture.